It’s been a while since I had a getaway, especially with my family. We do occasionally have short day trips but I haven’t had a vacation at somewhere I have never been for a while. Though I love going abroad for vacations, I do always try to discover my own country as much as I can. After all, Malaysia is my home and there is lots of Malaysia to be appreciated and enjoyed. We do often take for granted our own roots and the land we grew up on. 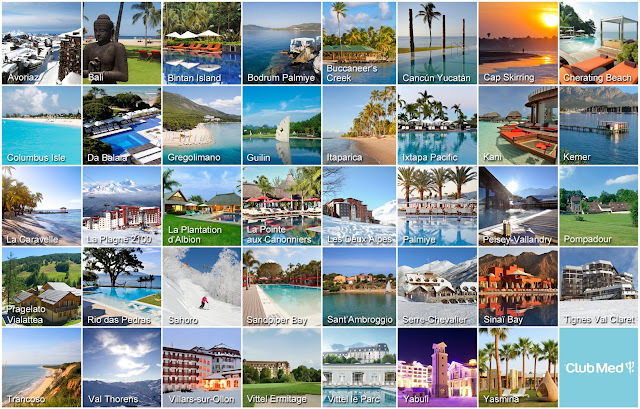 I have always heard about Club Med vacations. The closest one to me is Club Med Cherating Beach at Kuantan, Pahang. Club Med, an international premium all-inclusive holiday resort, is famous for their unforgettable travel experience all over the world. It is the perfect getaway for all as it is a one-stop destination where everything is taken care off and one can simply relax and enjoy all the activities and indulgences available at Club Med. With 80 resorts worldwide, it is a haven getaway perfect for families or couples and friends or solo. Discover some of the most beautiful destinations worldwide with the Club Med Premium All-Inclusive holiday packages available. The three of us had a short weekend getaway to Club Med Cherating Beach at Kuantan a few weeks ago and the 3D2N trip turned out unexpectedly awesome. Holidays or getaways don’t have to be long, it just has to be enjoyable and well-spent with families. I was excited. 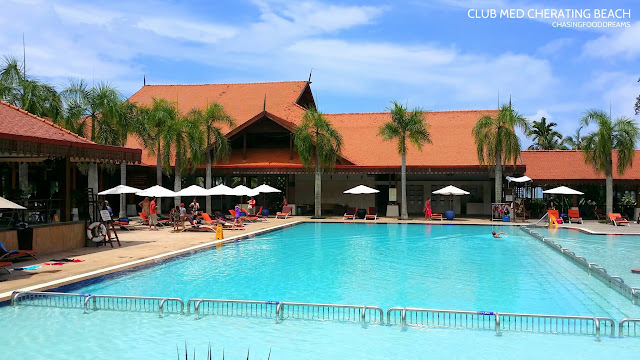 It’s my first time visiting Club Med and I wasn’t sure what to expect. However, I was aware that they have lots of fun things to do for everyone… from adults to children. So early Friday morning, the three of us got up early to catch our flight to Kuantan. Landing at the tiny airport on time but weather was a little gloomy. We were greeted by our road transporter from Club Med which greeted us right away with a smile. A quick load up in the van and we were handed bottles of water immediately. Our journey from the airport to Club Med was estimated about 45 minutes and since there was a light drizzle, it was a pretty nice and cooling leisure ride. My son was excited as I had told him that he was in for a treat at Club Med. As soon as we reached Club Med Cherating Beach, the weather started to brighten up. Gosh, it was endless acres of greenery. Nature is just gorgeous. As we drive into Club Med, the view of the majestic main building of the locally-inspired architecture was glorious. The building, set with a backdrop of nature greens and blue sky, stood tall and proudly built. After check-in, we were taken to our room 214 in the Harimau section which is a suite facing the China Sea. Now prior to going, I was told by friends that the rooms are not as new as other hotels. 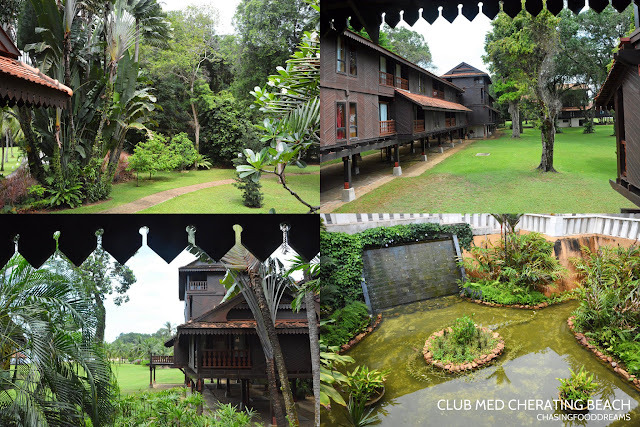 But then again, Club Med Cherating Beach is one of the oldest Club Med in Asia opened in 1979. When I walked into my room, it was really pretty in an old charm way. It may not be new but it is certainly well-kept and maintained nicely. 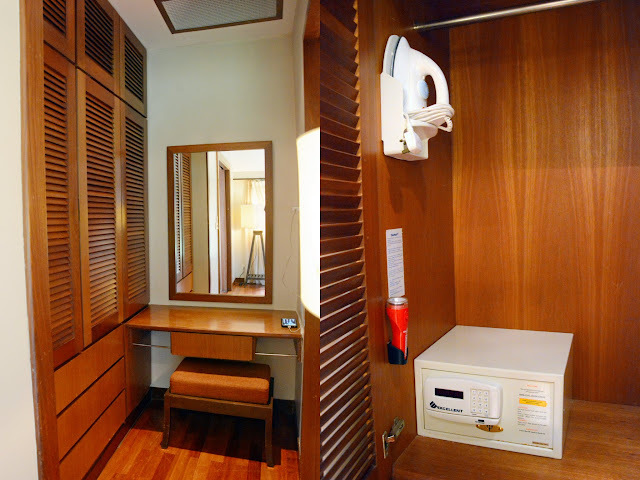 The suite is spacious with the living room and bedroom separated by a short section filled with facilities. The living room is nicely decorated with lots of wood and rattan. It exuded a comfy neutral ambience that encouraged guests to relax and unwind. We actually spent more time outside having fun though. There is also a desk for some work and a little corner table with Nespresso machine for coffee. There is tv and some board games for entertainment during evenings. The middle hall space has mini fridge with full stock up mini bar that is complimentary and refillable at all times. 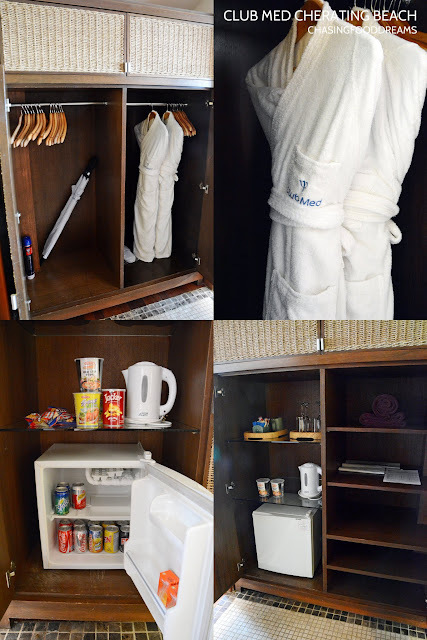 There is also tea kettle, extra towels, umbrella, mosquito repellent, robes, slippers, ironing board and iron, mini in-room safe and hair dryer. The free mini bar is such a great inclusion as it feels great to know that we can snack anytime in our room with lots of treats like instant noodles, nuts, chips and sodas. There are two separate toilets too in this suite. The bedroom is a four poster king sized bed. 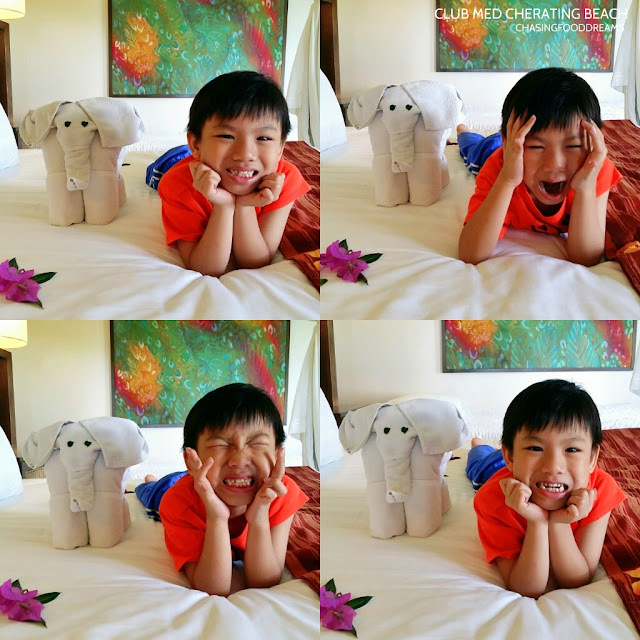 What thrilled my little one was the super adorable elephant towel on the bed with some petals nicely arranged on the bed. Since we had a little one, an additional bed can be added. The bed is nicely firm and comfortable while the pillows are plush and soft. I slept like a baby during my visit there. The room is also very cool with the air-condition system. Despite the heat and humidity outside, our room remained very cool during our stay. Look who's a happy camper as soon as he saw the bed with the cute elephant! Our suite main bathroom has a long bath and shower room. Set in neutral colors, the bathroom also has a large mirror. I do have to thank the housekeeping for their efforts in decorating the bathroom with petals and leaves. It certainly brightened up the room and added such a pretty touch to the ambience. The bathroom amenities include branded toiletries of shampoos, hair conditioner, body shower gel, body lotion, toothbrush, toothpaste, shower cap, soap and more. Walking out to the patio facing the sea, it was a lovely place for some R&R. With constant breeze all day, the sight of plush green lawn and blue azure sea, I find myself lounging there with a book while my little one had his own fun times with my other half. We took a stroll about the hotel and there were plenty of gorgeous sights of Mother Nature all around. A hot spot in any Club Med has to be the bar. We found ourselves constantly visiting the bar for free flow juices, sodas, mocktails, cocktails and alcohol. Yes, certain alcohol is complimentary! In case one runs out of clothing or certain basic necessities, then visit the Club Med shop to shop. I took a sneak peek at the shop and saw that it was filled with lots of fashion wear and swim wear. The fashion wear consisted of lots of t-shirts and casual designs. One particular note was the clothes all have the numbers 45 or 88 on them. Further checkings reveals that Club Med celebrated their 45th anniversary back in 1995 and a jersey with the number was designed and well-received by many, hence the 45 number remained throughout the years till now. The number 88 was more geared towards Chinese beliefs as the number 8 signifies wealth. Beside the shop, there is a casual library filled with books that guests may want to read or simply to laze around. 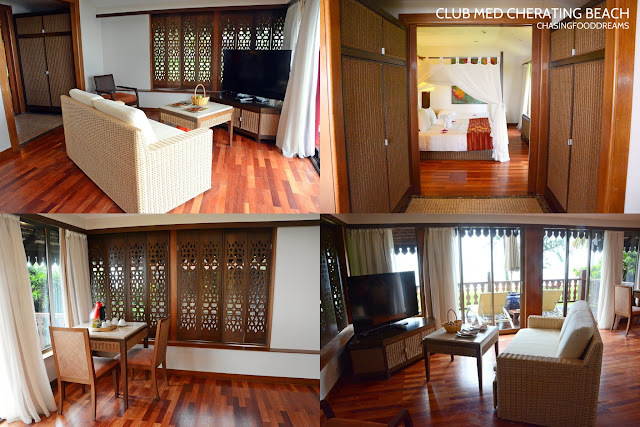 Walking in further, we saw Club Med’s wellness center manned by Mandara Spa. Beautifully segregated from the main building and it is connected with a long wooden bridge, this is where many can opt for their various wellness spa sessions. Club Med Cherating Beach has 2 main restaurants Mutiara and Rembulan plus a smaller casual dining Noodle Bar. We dine at Mutiara and the Noodle Bar a lot while we were there as Rembulan was closed for renovations. Find out more about the delicious spread in my next post! During the first day, we just relax and hang out around the pool. Then we had a lovely dinner buffet and joined the night entertainment at the theater with themed shows performed by the G.Os. 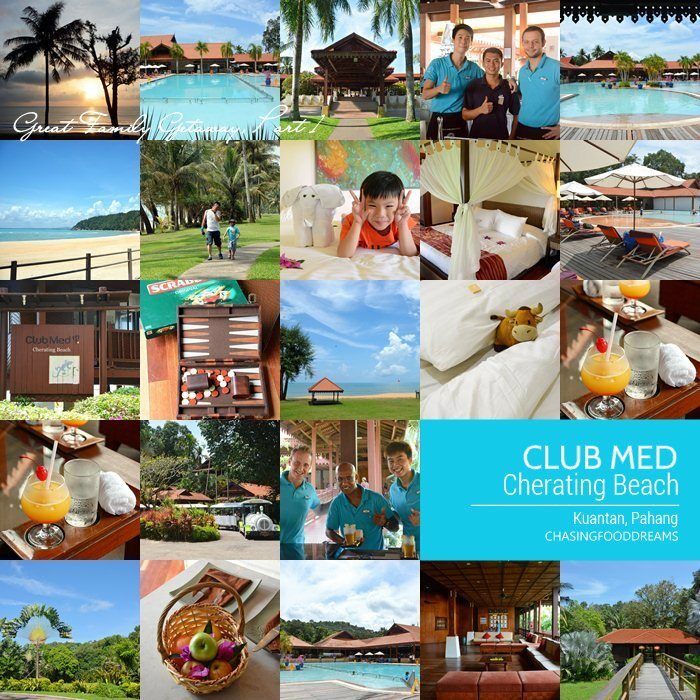 Club Med Cherating Beach, tropical paradise set within 80 hectares of protected rainforest, is certified with Green Globe and Earthcheck Silver for Sustainable Tourism. 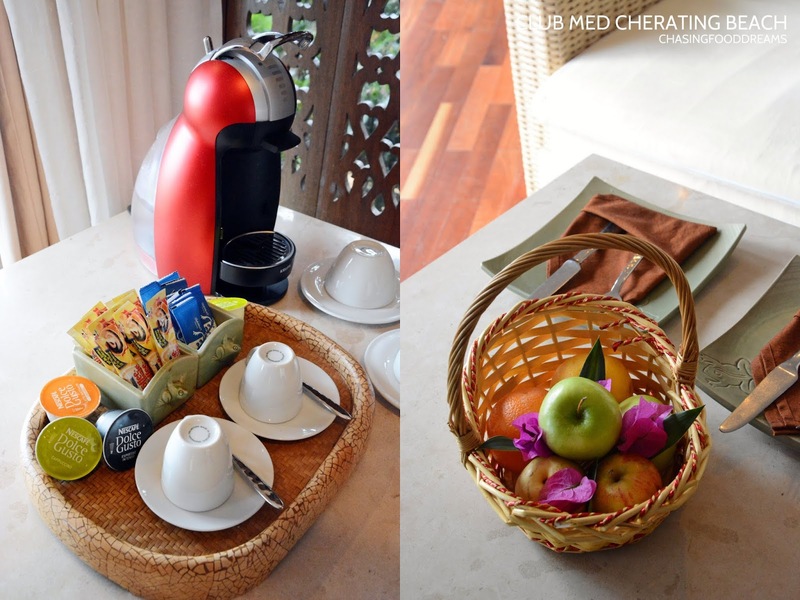 We like how eco-friendly this place is and also found out that Club Med Cherating Beach was named Best Family Resort in Asia by Trip Advisor.